Well, it's finally here! What we previously knew as the BlackBerry Mercury has been launched as the BlackBerry KEYone - that is, er, a rather different name. (clears throat). Moving on. The BlackBerry KEYone sports an aluminum frame, with a grippy textured back and impact-resistant display glass. It comes with the latest version of Android - 7.1 Nougat - and the BlackBerry Hub suite of applications. BlackBerry KEYone was brought to market through a brand licensing agreement in which BlackBerry Limited has licensed their brand to TCL Communication for further development of smartphones with the BlackBerry name - BlackBerry Mobile/TCL does the hardware design, marketing, and sales while BlackBerry Limited provides the software. The BlackBerry KEYone will be available globally beginning in April and will be priced at or under €599 EUR/£499 GBP/$549 USD. 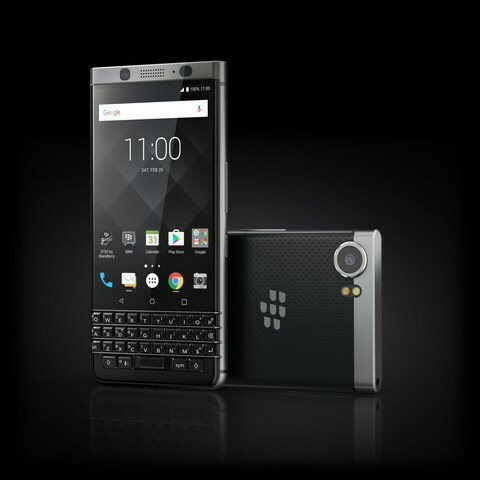 BARCELONA – February 25, 2017 – Today, TCL Communication, a leading global smartphone manufacturer, unveiled a new BlackBerry smartphone to the world – the BlackBerry KEYone. This launch represents the first BlackBerry smartphone released from TCL Communication under a new brand licensing agreement signed in December 2016 with BlackBerry Limited. Offering users all the great smartphone features you'd expect – like great camera, display and design – in a distinctly different experience, the KEYone pairs the best of BlackBerry Limited's software and security with TCL Communication's commitment to delivering high-quality, reliable smartphones to customers around the world. The BlackBerry KEYone will be available globally beginning in April and will be priced at or under €599 EUR/£499 GBP/$549 USD. "Impressively designed to be distinctly different, the BlackBerry KEYone reimagines how we communicate by offering unmatched productivity and the world's most secure Android smartphone experience," said Nicolas Zibell, CEO for TCL Communication. "We're humbled to play such an important role in the future of BlackBerry smartphones, which have been so iconic in our industry, and we're eager to prove to the BlackBerry community that their excitement around this new BlackBerry smartphone is something they can be proud of as well." "We want to congratulate TCL Communications on the launch of KEYone," said Alex Thurber, Senior Vice President and General Manager of Mobility Solutions for BlackBerry. "We have worked closely with TCL to build security and the BlackBerry experience into every layer of KEYone, so the BlackBerry DNA remains very much in place. We couldn't be more excited to help bring it to market and introduce it to BlackBerry fans." Tucked into an anodized aluminum frame and soft touch textured back, this new BlackBerry smartphone is built to offer the best in durability while still remaining easy on the eyes. Featuring a 4.5-inch display (1620x1080 resolution / 434 PPI 3:2 aspect ratio) with Corning ® Gorilla® Glass 4 that offers greater impact and scratch resistance, the KEYone combines a touch display with a physical keyboard to give users more useable space for typing than a typical 5.5-inch all-touch smartphone. With BlackBerry KEYone, you can forget what you knew about keyboards. The device's Smart Keyboard responds to touch gestures mimicking the heritage of the BlackBerry trackpad making web browsing, reading emails and writing messages with flick typing a much smoother and intuitive experience. This Smart Keyboard can also be easily programmed to launch up to 52 customizable shortcuts, such as pressing "I" for your inbox or "M" to access maps; providing even greater ease of use. In addition, KEYone is the first smartphone to provide the security of a fingerprint sensor built directly into the keyboard spacebar, for added functionality and security. Beyond the iconic BlackBerry design that's been curated for the modern user, the BlackBerry KEYone comes with a number of features and security enhancements making this smartphone distinctly BlackBerry. Out of the box, the device runs Android 7.1 – giving users access to the entire Google Play store and apps - and will receive Google security patch updates. It comes loaded with BlackBerry Hub®, bringing all your messages into one consolidated place; including emails, texts and messages from any social media account. Another benefit of BlackBerry Hub, is the ability to manage multiple email accounts without switching between apps, with support for Gmail, Yahoo Mail, Outlook, Microsoft Exchange accounts, and many other IMAP and POP3 email providers. What really sets a BlackBerry smartphone apart from any other Android device are the enhanced security features built into every device right from the start. From a hardened operating system to BlackBerry Limited's proprietary technique for establishing a hardware root of trust adding security keys to the processor, the BlackBerry KEYone is intentionally designed to offer the most secure Android smartphone experience possible. This device comes pre-loaded with DTEK by BlackBerry, offering constant security monitoring and protection of your operating system and apps by letting you know when your privacy could be at risk and how you can take action to improve it. A quick glimpse lets you see the overall security rating for your device and provides simple access allowing you to easily improve your security status. This BlackBerry security application monitors your other apps, alerting you if one is accessing your camera to take a picture or video, turning your microphone on, sending a text message, or accessing your contacts or location. Beyond the design and security features making the BlackBerry KEYone so distinct, these additional features truly reinvent mobile communications for the business and enterprise user. At the core of this new BlackBerry smartphone is the Qualcomm Snapdragon 625 mobile platform with the Qualcomm AdrenoTM 506 GPU. This means BlackBerry KEYone users will enjoy long battery life thanks to more efficient battery usage and fast LTE speeds for super-fast file sharing. It includes Qualcomm Quick Charge 3.0 technology, making it possible for the 3505 mAh battery on the KEYone – the largest ever in a BlackBerry device, to receive up to 50 percent charge in roughly 36 minutes. And for when you only have a few moments to grab a fast charge, BlackBerry's Boost can turbo charge your battery to get you the most charge with the limited time you have. "We are proud to be working with TCL on the BlackBerry KEYone," said Enrico Salvatori, senior vice president and president, Qualcomm EMEA. "The Snapdragon 625 mobile platform with X9 LTE and the Adreno 506 GPU is purpose-built for users who demand superior performance and connectivity coupled with outstanding battery-life." The BlackBerry KEYone experience would not be complete though without a great camera. That's why it includes a 12MP rear camera with the industry leading Sony IMX378 camera sensor. With a large pixel size(1.55μm) and Phase Detect Auto Focus, moments captured on the BlackBerry KEYone will be ultra crisp and clear. And for when you have to take a video conference on the go, it includes an 8MP front camera with fixed focus and 84-degree wide angle lens. For more information about the BlackBerry KEYone and to register for pre-order updates, please visit www.BlackBerryMobile.com. TCL Communication Technology Holdings Limited (TCL Communication) designs, manufactures and markets an expanding portfolio of mobile and internet products and services worldwide under three key brands – TCL, Alcatel and BlackBerry. The company's portfolio of products are currently sold in over 160 countries throughout North America, Latin America, Europe, the Middle East, Africa and Asia Pacific, TCL Communication ranked as a top-10 global smartphone manufacturer by IDC. Headquartered in Hong Kong, TCL Communication operates nine R&D centers worldwide, employing more than 13,500 people across the globe. For more information, please visit www.tclcom.com. TCL is a registered trademark of TCL Corporation. All other trademarks are the property of their respective owners. Alcatel is a trademark of Alcatel-Lucent used under license by TCL Communication. Trademarks, including but not limited to BLACKBERRY and EMBLEM Design are the trademarks or registered trademarks of BlackBerry Limited, used under license, and the exclusive rights to such trademarks are expressly reserved. All other trademarks are the property of their respective owners. BlackBerry is not responsible for any third-party products or services. Qualcomm, Snapdragon and Adreno are trademarks of Qualcomm Incorporated, registered in the United States and other countries. Quick Charge is a trademark of Qualcomm Incorporated. Qualcomm Snapdragon, Qualcomm Adreno and Qualcomm Quick Charge are products of Qualcomm Technologies, Inc.